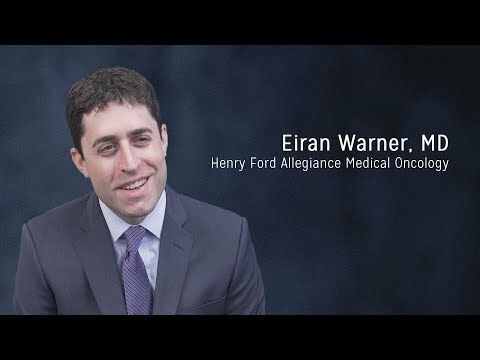 Dr. Eiran Warner is a specialist in Hematology and Medical Oncology and is board certified in internal medicine. Hematologists are physicians who diagnose and treat diseases and disorders of the blood, such as leukemia (a cancer of the body’s blood-forming tissues), thrombosis (blood clotting that blocks a blood vessel) and lymphoma (cancers that start in cells of the body’s immune system called lymphocytes) . As a medical oncologist, Dr. Warner's focus is treating cancer with medicine or chemotherapy. His areas of special interest include cancers of the lung, breast, digestive tract, urinary system and reproductive organs. Dr. Warner is a member of the American Society of Clinical Oncology, American Society of Hematology, and the Michigan Society of Hematology Oncology.